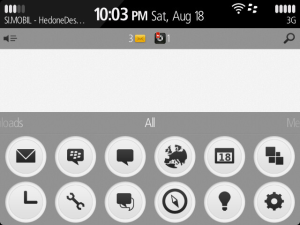 HedoneDesign Jam is minimalistic, astonishly designed and wallpaper friendly theme with „easy to get used to“Â icons. 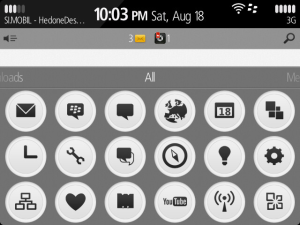 Put your icons in a spotlight with the new HedoneDesign theme, Jam. Brilliant white circles ensconce a sharp, clean, easily understood, and unique icon set. Fixed icons will be enhanced with the spotlight effect as well. Unique and beautiful meters in the top banner. 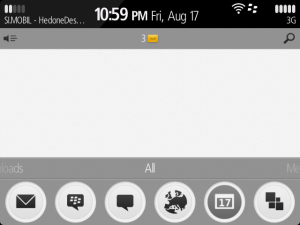 Even if BlackBerry theme studio is still not released by RIM we are preparing themes for some of BlackBerry 7 devices. It takes a lot more time and precision but we are glad to provide you with this themes. Important: Wallpapers shown on screenshots are not included! 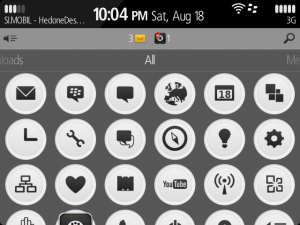 Jam is theme we’ve build on BlackBerry 7 theme and you’ll enjoy all the functions of new BlackBerry 7 UI but with new graphics, icons and other UI elements. Jam wont take any speed from your device and wont need any more battery power than original theme that came with your device. Since some of graphics are optimized and smaller, you may even notice a slight improvement in speed and battery life. Veröffentlicht am 12/09/2012, in 9850 & 9860, BlackBerry, Theme´s. Setze ein Lesezeichen auf den Permalink. Hinterlasse einen Kommentar.